This weekend was mostly standard yard work; mowing, edging, spreading pine needles, etc. Got the berry bush area looking nice with a new layer of pine needles. Olive found the pine needles to be nice and cushy - a perfect shady spot to chill. THEY'RE TURNING BLACK, THEY'RE TURNING BLACK!! Look! Our squash blossoms have squash growing behind them. Yep, green squash alright. What? You think that's zucchini, not squash? But... I feel CERTAIN I planted squash seeds. ? Look! Our zucchini blossoms have zucchini growing behind them! This picture of borlotto beans is from last Thursday when I planted the seedlings. Here they are, a mere five days later. WOW! There were four plants but only two had popped up. Now, all four are up and they've just about doubled in size. The weather is still nice so this week and weekend will be our big end-of-Spring push to get everything in the ground before the weather becomes too hot. 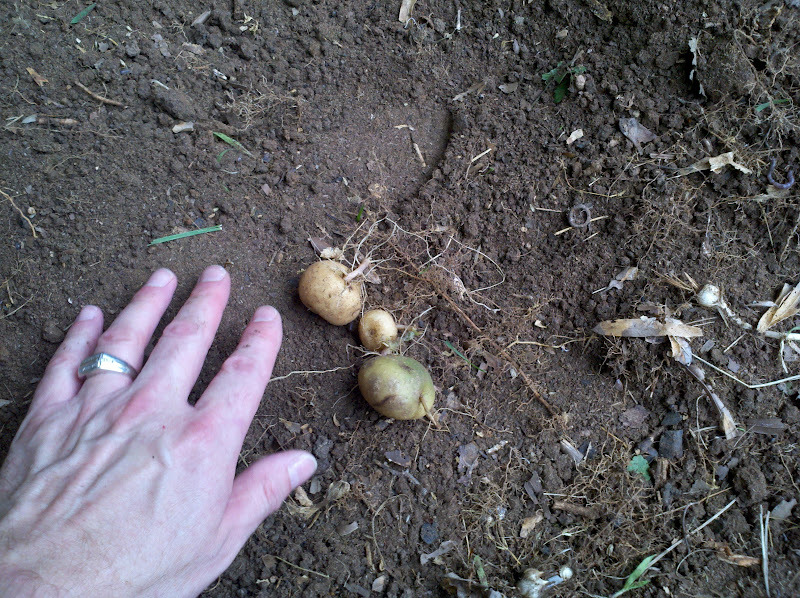 Last weekend Tom took care of the potatoes. 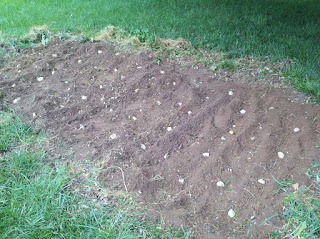 He started by tilling up the potato patch. There were signs of onions growing, but when he pulled them up, there were hardly any bulbs to them. We're finding that this patch is really only good for potatoes, so that's what we'll stick to for this mostly-shady spot. 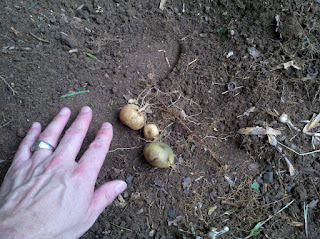 During the tilling process, he found a few potatoes left over from last fall. He created rows and dropped the potatoes in. 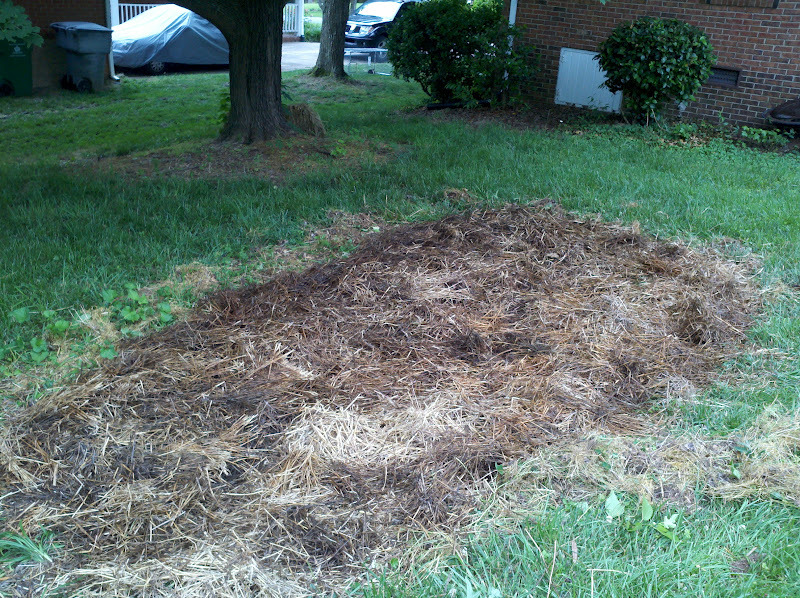 He covered the whole area with straw that he'd used as a wind block for the bees over the winter. 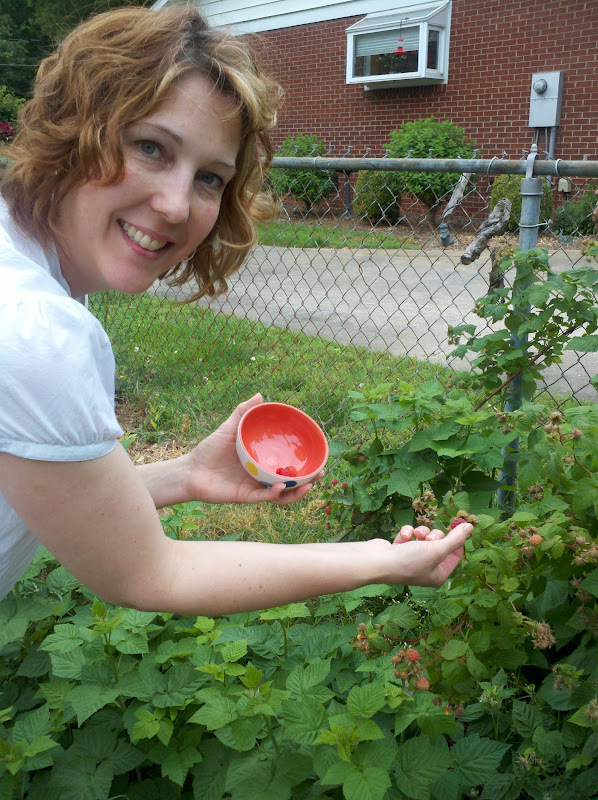 The raspberries are coming in a hand-full or so at a time. This is probably a two cups or so. Hee hee! Blackberries taking their time ripening. 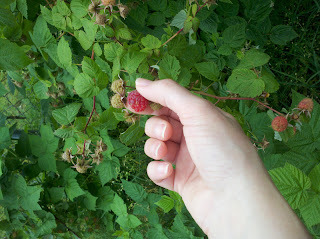 Trying to be patient but COME ON BERRIES; HURRY UP AND RIPEN! I got jam, cobblers, and crisps to make! Blueberries moving from green to green-blue. I started flower seeds a month or so ago. The two on the outsides are sunflowers, the one in the middle (which you really can't see) are wildflowers. Because it appeared that the cold snap killed the basil, I started some more in pots. I was going to restrain from over doing the basil this year but I think I'm going to end up with an abundance once again. It's hard to see but right in the middle of this photos are a bunch of very small seeds that sprouted. I went ahead and planted them all. And as luck would have it, the basil (front) that I thought had been killed off is doing FANTASTIC. The oregano (back) was a cutting from a student of mine, and it's doing well too. Yesterday I did a LOT of weeding - something we haven't kept up with very well this Spring. 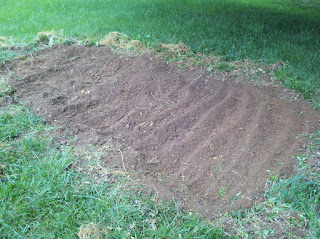 After weeding all of bed #1 and parts of the other three, I set to getting all the seedling planted. Longtime followers of TYs VeggiePatch will no doubt recognize this flower because we've taken a similar picture every year. Squash blossoms have arrived. This is the other squash plant. Both of these are the crookneck variety we've grown every year. The other two squash plants (not shown) are a new variety and not nearly as far along as these. and these are the burgundy beans. It's nice to look at your garden when it isn't overrun with weeds, don't you think? In addition to planting the beans, I trimmed back the dill and cilantro, planted additional cilantro seedlings, and pulled out the unsuccessful broccoli and cauliflower. (Shhh... don't tell Tom. He has a hard time pulling up plants that are still alive, but these hadn't produced any broccoli or cauliflower and they certainly won't as it gets hotter). The mesculin (sp?) lettuce didn't look close to bolting so I kept it in. 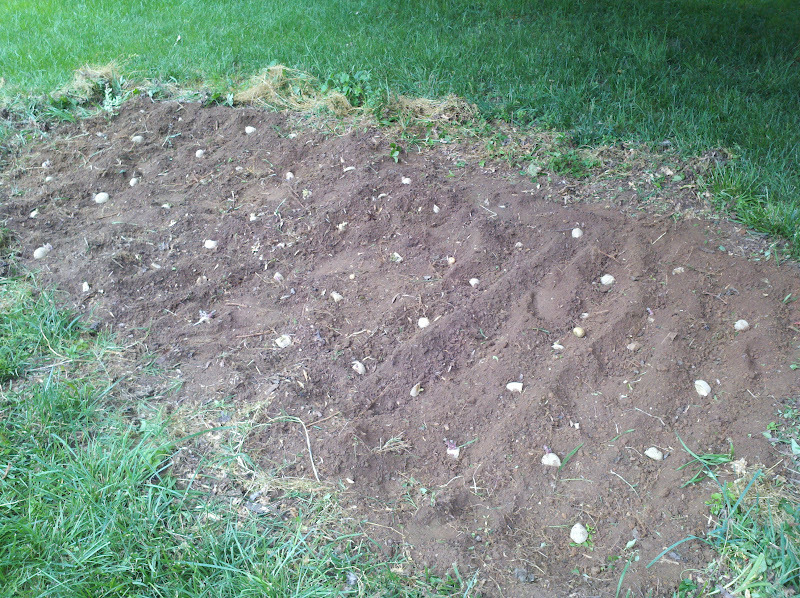 In place of the broccoli and cauliflower I planted the golden and banana peppers. Seems as though when the scapes grow, they produce the seed pods and will soon turn into a puffy flower. Looking forward to seeing what this looks like when it opens up all the way. Stay tuned. After several days of good rain, I knew there'd be lots of peas ready to harvest. And boy was I right. Just pulling off the largest ones gave me about four cups worth. Look at how huge this one is! This is one area I didn't weed yet so it's hard to distinguish what's what. But what you're mainly looking at is the cowpeas that struggled to come up. Once they did come up, it looked like they got killed by the cold. Then they came back. They are officially doing well. Now... if I can just remove enough of the weeds to really see what I've got. it already has okra forming! I'll be happy if this thing doesn't become a 10' tall tree like the ones in past years. The amount of rain we got caused everything to quadruple in size. This kale had a few leaves at best the last time I looked. Now, it's over taking the beets! this is the result. I harvested a lot of the kale (now shown to the left of the beets) and made kale chips (YUM!). Didn't do anything with the beets at the moment but this weekend I'll harvest several and roast them up for Roasted Beet and Goat Cheese Salad. I also trimmed the parsley "hedge" on all four sides as well as the top. Now it no longer hangs over the bed. This allowed room for a few more tomoato plants. These tomato plants will likely get way too big to be here, but by that time the beets and kale will be gone so we'll encourage it to grow towards where the beets currently are. I couldn't seem to get rosemary started from seed so I asked around for anyone who might be able to spare a clipping from an established plant. 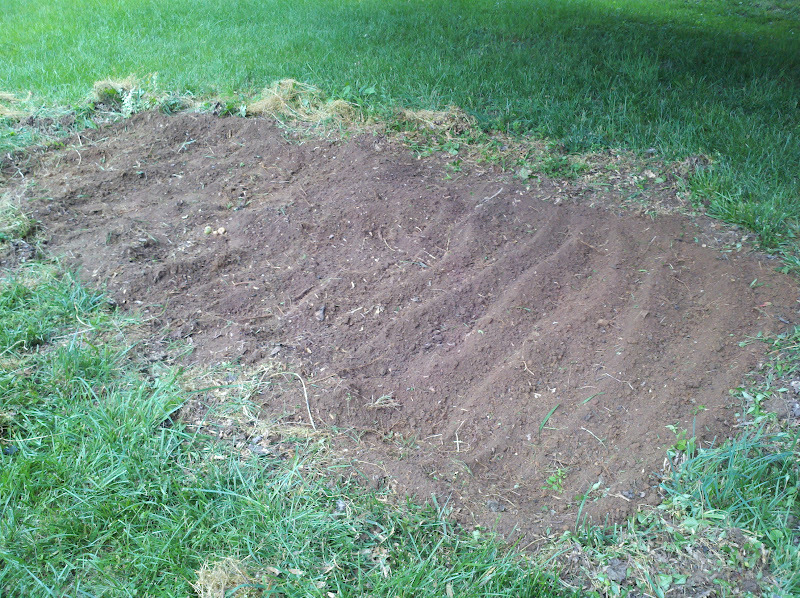 I put this cutting in the bed where we can't seem to get anything (but more weeds) to grow. We'll check back in a week or so to see if it's taken root. Fig tree still doing well. Hopefully it will make it out of the pot and into the ground sometime this year. Whew! I worked hard to get as many of the seedlings planted as possible and seeing how little is left in the mini-greenhouse, I'd say I did a good job. What's left are onions, chives, and a mystery plant. 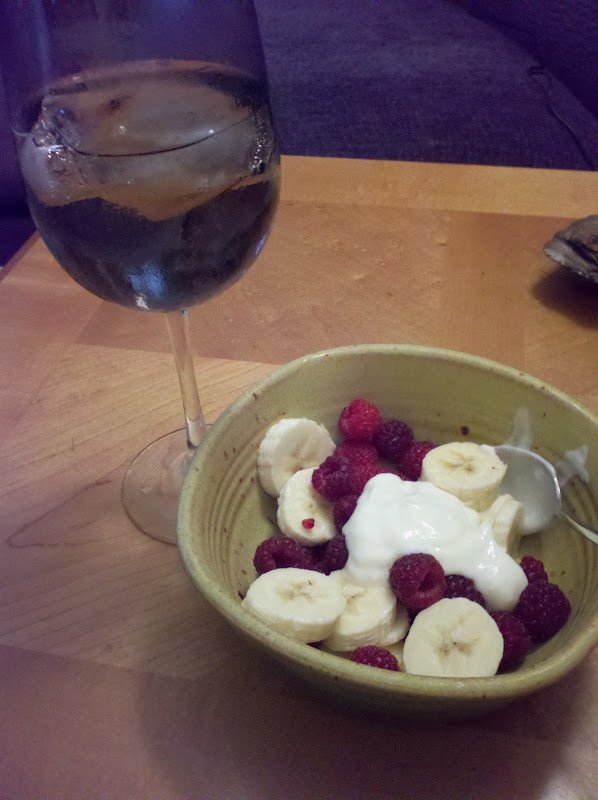 A reward for a hard day's work in the garden. A glass of champagne and a bowl of raspberries, bananas and a dollop of vanilla yogurt. 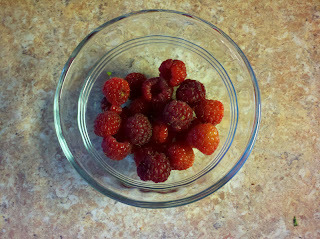 OMG - fresh raspberries from my own yard! OK so there weren't a TON ready, but they were delicious all the same. 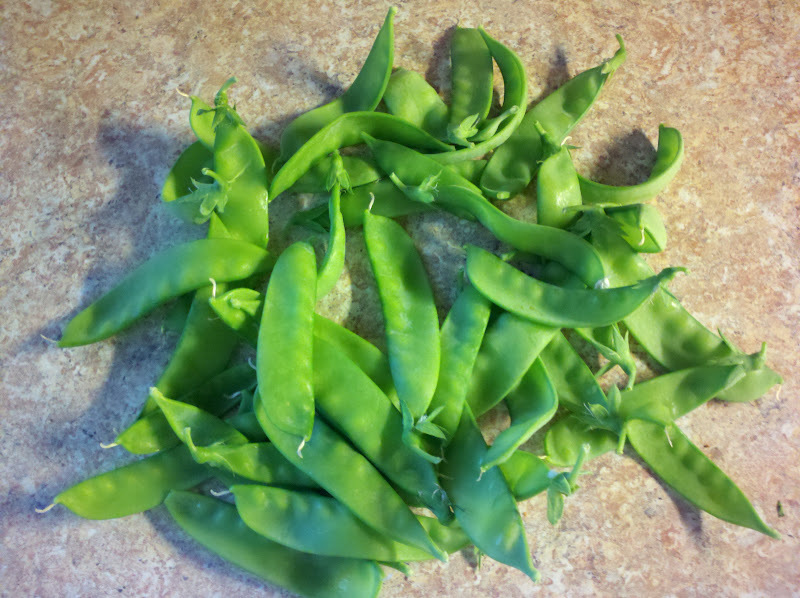 The snow peas have come up and they are as fantastic as last year. I sauted up a batch with a little S&P last night for dinner. I'll be participating in a craft show all weekend so there likely won't be a post for next week. 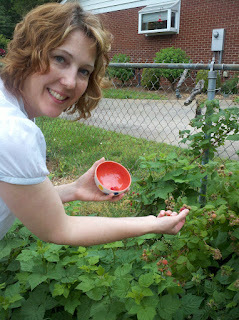 It is so wonderful to watch the blackberries coming in. 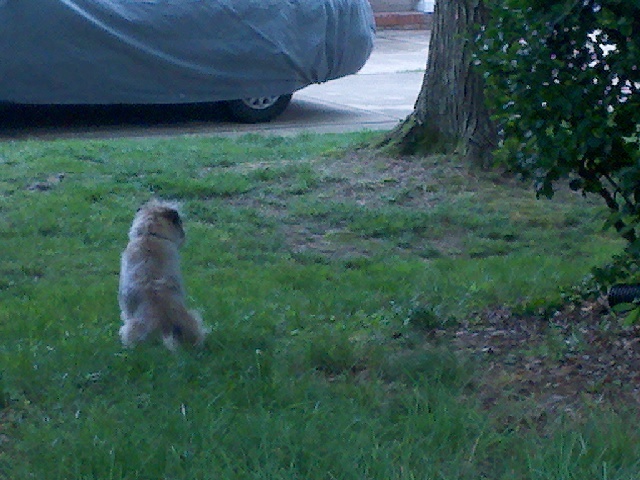 They are right next to the driveway so we get to monitor their progress daily. some of THEM are turning red!! The blueberries are more like greenberries at the moment. They're small, but we'll take 'em! The largest sprouts in the back are sunflowers. The smaller ones in the front are a variety of wildflowers. Here we have some melons, and a few peppers. In the back row are some spring veggies (lettuces and broccoli) that are too late to put out. They look good here, but it will be far too hot for these guys to survive. Some herbs are still coming along. Now that we've hit the high 80s/low 90s, these rest of these guys will hopefully start taking off. If new sprouts don't come up by this weekend, I'll replant. Some new onion seeds that were planted a few weeks ago have come up. Struggling basil. Plenty of time to start some more so I'm not worried. Oregano, some of which I used the other day. Scapes on the tops of our garlic. Last year we harvested them, but didn't know how to use them. I found some recipes and this year, we're using 'em. Basically use them as you would garlic but the flavor will be more mild. My plan? Pesto. If they aren't around long enough for the basil to mature, I'll make a parsley-based petso. The broccoli and cauliflower are disappointing once again. No signs of the actual vegetable and now that it's hot, we'll have to pull them out soon. Anyone have tips on growing this stuff? I suspect we are trying to grow them in the wrong season. I know I said this was the last time I was going to try it, but I think I'll try again for fall/winter. We'll be eating as much of this in the next week or so as possibly because it too will bolt soon. Thyme, dill and cilantro are doing fine. Each week the squash plants seem to double in size. Even these two squash plants that had been damaged in the cold have sprouted new leaves so I think they're going to be OK as well. The radishs are just about done. I'll pull the remaining four or five and we'll have those in our salads this week. Spinach is just barely showing signs of bolting so the race is on to use it up by this weekend. The largest chard plant on the left has bolted but I think I can get one or two more dishes out of them before pulling them up this weekend. Finally looked in our garden layout to see what the heck this is - chamomile! One okra hanging on (among a ton of weeds). It won't be long before this becomes a 10 foot tree. Cow peas (and a lot of weeds) struggling, but still there. One week it looks like it's not going to make it, then new leaves show up. We'll see what happens. PEAS!!! There were enough for a handful to snack on. The plants aren't nearly as tall as they were last year, but that may be because of the type of trellis we're using this year vs. last. Carrot tops (and lots of weeds) looking good. Beet greens are looking good, but I noticed some of the bulbs have popped out out of the ground. I stuck them back in hopes they'll hang on and get bigger. The sad, yellow thing in the upper right and lower left corners were cucumbers. Luckily, there are seeds that have spouted in the min-greenhouse so all is not lost. Dinner last night was sauted chard, garlic, lemon juice, and a can of chick peas tossed with cork-screw pasta and feta. If you miss following the progress of the bees, go to Ts Bees Blog. Once there, click on the link in the upper right corner that reads "Subscribe to Ts Bees Blog by email" and you'll get an email when there's a new post.